Program Outcome - What does an effective instruction program do? Program Criteria - How do you determine if you have achieved your outcomes? What will constitute success? 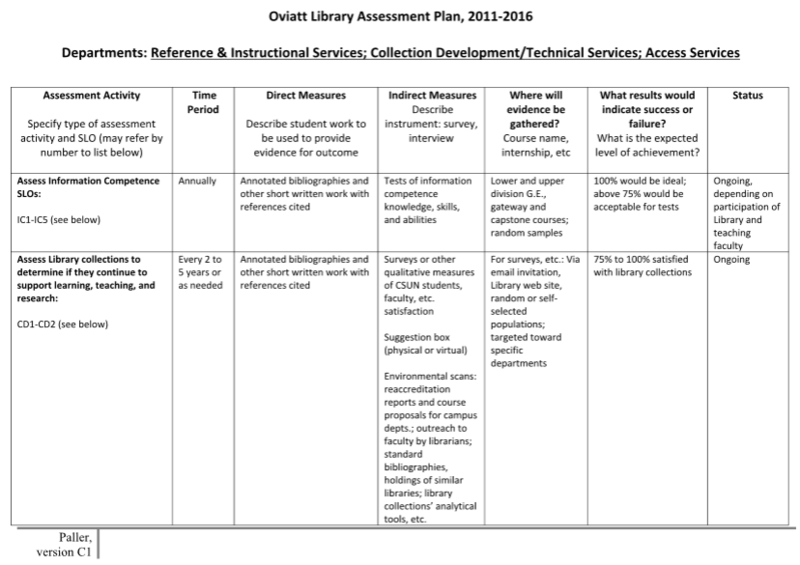 Program Assessment - How will data or evidence be collected? Program Analysis and Evaluation - How will the discussion or evaluation of the data occur? Who will be involved? Program Change - What changes will be enacted? Who will take leadership? What is the timeline? What resources are required? Zald, A. E., Gilchrist, D. (2008). Instruction and program design through assessment. In Christopher N. Cox; Elizabeth Blakesley Lindsay, Information Literacy Instruction Handbook 164.192. 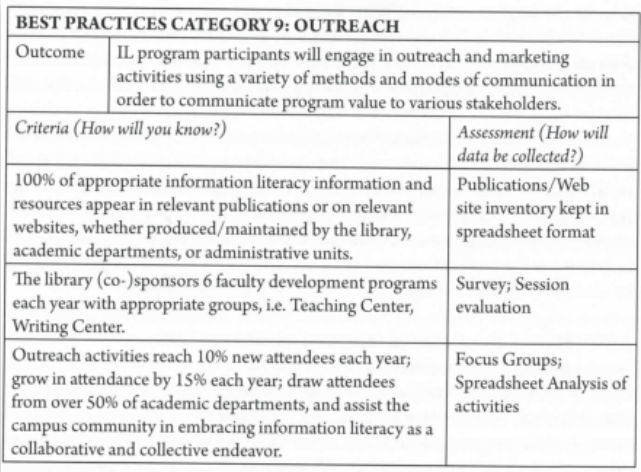 Building an intentional IL program provides a blueprint for integrating information literacy into your University's curricula at appropriate learning points throughout a student's academic experience. A program helps faculty and curriculum committees and administrators understand the scaffolding needed to build information literacy competencies in students and ensures that students graduate with strong information literacy skills and competencies. Standardized assessments are those tools where institution's can compare their results to other institution's results. Examples are listed below. developed by a group of Canadian academic libraries for assessment of first and second year post-secondary students on information literacy through the open source survey tool WASSAIL. The following are assessment methods/programs developed for individual institutions. A matrix form that can be downloaded and used for your respective information literacy programs. Plan outlined from the University of Texas. A handbook from the University of Massachusetts, Amherst. should encapsulate the purpose of the IL program as it relates to the institutional mission and the needs of its learners. should articulate outcomes that can include concepts and skills found in ACRL's Information Literacy Competency Standards for Higher Education, ACRL's Framework for Information Literacy in Higher Education, and an institution's learning outcomes. should include differing environments of learning (e.g. classroom teaching, online learning, research consultations) and pedagogy methods used in the classroom with emphasis on active learning and developing critical thinking skills. should map the points in its institution's curricula where info lit competencies are taught and learned. It's the process of identifying where IL programming fits within an institution's general education & discipline curricula, and within the progression of a student's undergraduate learning (first-year vs. senior year IL competencies). should be based on an IL program's student learning outcomes and overall program goals. Below are institutional info lit program statements. While they may not describe all of the criteria noted above, they provide examples of program components.